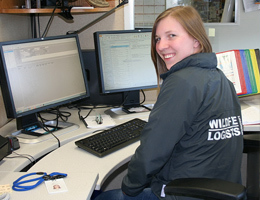 The Logistics Coordinator reports to a designated Wildfire Ranger in the Area and is responsible for supervising the Logistics section. This position will coordinate all staffing, logistics, and supply needs as directed by the Area Duty Officer including manpower, fireline equipment, heavy equipment, light equipment, specialized equipment, ground transport, fuel, communications, accommodation, meals and commissary. This position requires excellent communication and organizational skills, ability to multi task, commitment to work long hours when required, knowledge in various software programs, and ability to learn and utilize database software. Preference will go to applicants who have prior experience in coordinating and/or arranging projects or activities. Coordinate all staffing, logistics and supply needs including manpower, fireline equipment, heavy equipment, light equipment, specialized equipment, ground transport, fuel, communications, accommodation, meals and commissary. Interacts with the Alberta Wildfire Coordination Centre for operational manpower/equipment requirements and responds to requests from AWCC for resources and manpower using the Resource Request module in FIRES. Review problems and correct deficiencies with Contracts. Complete the rotational hiring and release, audit time tickets and invoices, and monitor rental returns. Provide mentoring to Logistics support. Monitor and audit the data entry being completed by Logistics Support to insure all spread sheets and databases are being up-dated with real time information. All work preformed will be conducted in a safe manner reporting all accidents, incidents, and near misses. Be familiar with applicable policies, standard operating procedures, and contracts. Mobilize and demobilize the Logistics organization as the level of fire activity within the Area increases or decreases. Keep warehouse staff informed of current and forecasted logistics and supply needs. Organize, maintain and adjust the required workspace as operations change. Insure the information boards are kept current. Maintain the Logistics Information Management System which involves continual updates of a number of spreadsheets including but not limited to tracking staffing levels, import and export personnel, days of rest and annual leave, work schedules, work assignments and equipment rentals. Ensure all logistics staff maintains a personal daily unit log as well as record daily events in the Logistics log. The typical work week is 36.25 hours (7.25 hours/day). You will be required to work overtime as required when the Area has ongoing fires. Both on-the-job and specific software training is available. If you are required to complete any tasks requiring specific training it will be provided. i.e., Transportation of Dangerous Goods.